Last week's winner of Keturah and Lord Death is Michael Offutt!! Congratulations. 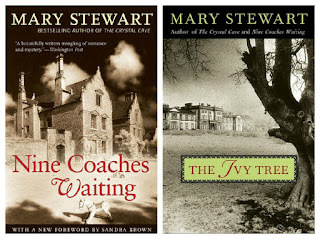 This week I'm giving away two books by the author Mary Stewart. She is often called the founder of the romantic suspense genre. I've read at least a dozen of her books. My favorite is Nine Coaches Waiting, followed by her Merlin Trilogy (which isn't romantic suspense, but they are amazing). Since my novel, A Blind Eye, is romantic suspense, I'm sticking to that category and giving away a copy of Nine Coaches Waiting and The Ivy Tree. These are classics. Her interesting characters, intriguing plots, and exotic settings are her trademarks. Mary Stewart's books have been a big influence on my writing. Also, for the lucky winner, I'll throw in a bit of swag to promote my own book. 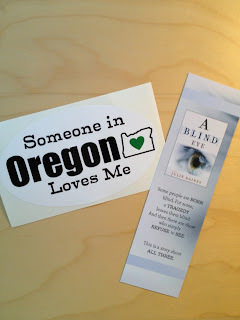 A Blind Eye bookmark and an Oregon bumper sticker. Exciting, I know, but try to keep calm. 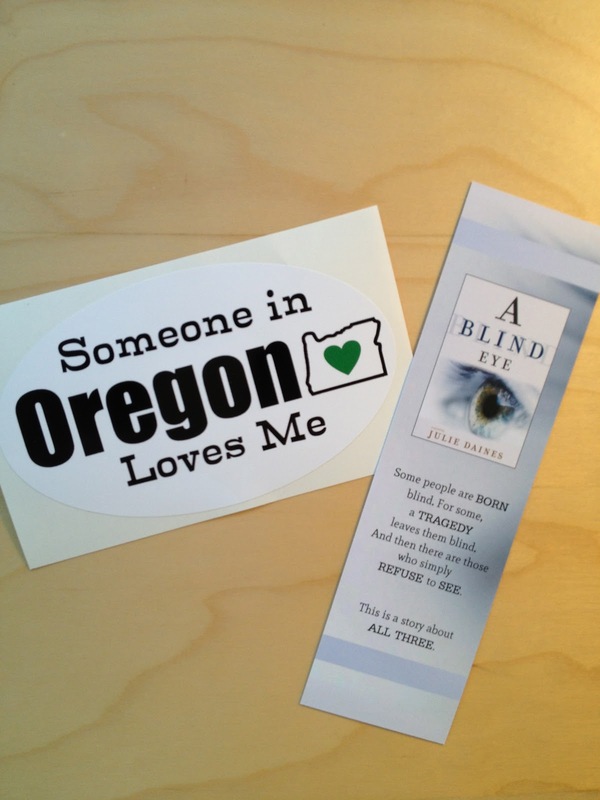 If you want to know why the bumper sticker--you have to read the book! Next week the prizes get even better! TWO Shannon Hale books, signed, and a copy of my book, A BLIND EYE! plus more swag. You know you want them all! The time has come for me to start promoting my book. I'll be running a series of giveaways leading up to the release of A Blind Eye in February. I've decided to give away copies of my favorite books by the authors who have really influenced me as a writer. I will tell you a story of magic and love, of daring and death, and one to comfort your heart. It will be the truest story I have ever told. Now listen, and tell me if it is not so. Keturah follows a legendary hart deep into the forest, where she becomes hopelessly lost. Her strength diminishes until, finally, she realizes that death is near--and learns then that death is a young lord, melancholy and stern. Renowned for her storytelling, Keturah is able to charm Lord Death with a story and gain a reprieve--but he grants her only a day, and within that day she must find true love. 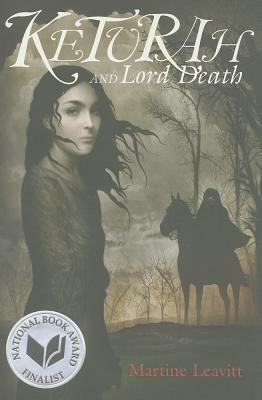 This week's prize is a brand new copy of Martine Leavitt's Keturah and Lord Death. I LOVE this book. The story is sweet and sad and wonderful, the writing is divine. I can honestly say this book changed my life. I had the great privilege of taking a week-long writing workshop from Martine Leavitt. She is brilliant, and I learned more than I ever thought possible about the craft of writing and storytelling. She is an amazing person. If you haven't read any of Martine Leavitt's works, you should. Her latest book, "My Book of Life by Angel," is a breathtaking novel in verse about a young girl trapped in the world of prostitution. You have several chances to win this delightful book. Just follow the instructions in the Rafflecopter below--and thanks for helping me spread the word about my own book! I'll be giving away TWO awesome books next week by another author who influenced me! What Is Your Character's Shire? I've been reading several stories lately with struggling characters. And by struggling, I mean characters that are inconsistent and hard to believe. If you are struggling to make your characters come across as real, believable, and engaging to readers, here is a little piece of advice that might help. Establish what each character's motives are. What is the one thing that that character wants, and why? Once you figure that out, everything a character does should be to achieve that goal. Even if the choices they make aren't always the smartest, in the character's mind they should be to achieve that one, all important goal. This will keep your character consistent and believable. Your main character's objective should be obvious to the reader in the first chapter. What one goal of Katniss's drives the story forward and is at the root of nearly everything she does? Her desire to protect her sister, Prim. She volunteers to go to the games in place of Prim, and she wants to win not just to survive, but so she can be there for Prim. What is it that Mary longs for? To see the ocean, and thus have a connection with her mother. This is what drives Mary out when the walls are breached and keeps her going. In my opinion, this comes across as a selfish motive, but at least it is consistent. And let's face it, teens often have selfish motives. What objective does Frodo have in his heart that keeps him going on his impossible quest? The Shire. He wants to get back home to the Shire, and he wants the Shire to be safe and uncorrupted by Sauron. You have to find your character's Shire. Come back next Monday for the first of many contests leading up to the release of A Blind Eye in February!